Prague has an epic history. It's inhabitants have experienced a declaration of independence, Nazi control, brain washing communism and capitalist democracy. And that was just the 20th century…Prague was one of the most beautiful European cities since the Middle Ages and has had many nicknames as “ City of 100 towers”, “ Heart of the Europe”, “ Golden Prague”. First mentions about initial inhabitants of Vltava valley goes to very deep history, when Celtic tribe come in 500 BC. First Slavonic tribe had arrived to Bohemia in about 500 AD. 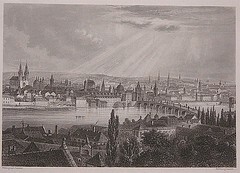 Prince Borivoj established the Prague Castle; in 10thcentury fortress Vysehrad was built on the rock upon the Right Bank of the river Vltava. Both fortresses have become very important places of Czech rulers. Prince Wenceslas, which was one of them, was in 935 murdered, later was canonised and then become Bohemian saint patron. Prague is a complex of historical monuments and shows all artistic styles. The historical centre of Prague is situated on both banks of the river Vltava. Historical centre consists from the 6 quarters, which once were independent cities and were put together in 18th century. Those are Old Town – Old Prague Hostel location - , Jewish Quarter - Josefov (there is a well preserved part of Old Jewish Town, today part of Old Town), New Town, Little Quarter, Hradcany and Vysehrad. There are cumulated many museums, galleries, and historical buildings. Prague, Main City of the Czech Republic is the most significant city historical reservation. Since 1992 is Prague historical centre put to the list of world culture and nature heritage register UNESCO. The history of the city goes back to the foundation of Prague Castle by Borivoj in 870 AD. Prague Castle has been a symbol of Czech history for centuries. 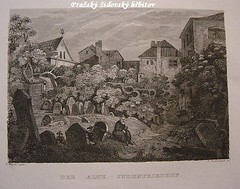 After 894 it became the main seat of the oldest ruling dynasty of the state Bohemia, the Premyslid princes (Premyslovci). The first to leave a written record of the existence of a busy commercial centre and settlement below Prague Castle was the Arab-Jewish merchant Ibrahim Jakub, who visited Prague in 965 or 966 and described it as a town "built of stone and mortar". During the first half of the 11th century, on the opposite bank of the Vltava another castle was founded, called Vysehrad. The house of the Premyslids, also present at its birth, thereby demarcated future settlement areas. At the same time the first stone bridge (Judith's) was built. Medieval Prague originated as an agglomeration of towns and several smaller settlements of craftsmen, merchants, and farmers. Stone fortifications protected Prague's Old Town as it grew from the right bank of the Vltava. In 1257, Premysl Otakar II founded Prague's Smaller Town (Mensi Mesto - later renamed Lesser Town, Mala Strana) on the left bank and summoned colonists from northern Germany to settle there. In the 1330's Prague's third town - Hradcany - was established as a town of subjects under the administration of the burgrave of Prague Castle. In 1230 Prague became a town during 13th century the Old Town and the Lesser Town were founded by colonization. The beginning of the fourteenth century saw a series of dynastic disputes - beginning with the death of Vaclav II. from consumption and excess in 1305. The following year, the murder of his son , the heiress, Vaclav III., marked the end of the Premyslid dynasty and Bohemia was left without any heirs. In 1310 Czech nobles offered the throne to John of Luxembourg but it was his son Charles IV. (1346-1378) Charles IV and his Golden Age. During the epoch of the Czech king and emperor Charles IV(1346 – 1378) Prague had flourished. It is said, that Charles IV was very intelligent and educated, therefore lead the Czech land to the top of economic and cultural bloom. 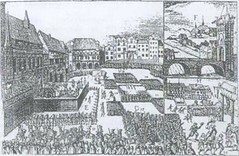 Prague was promoted to emperor residence, and political centre of Europe. In the start of his reign, in 1348, founded High school – The Charles university, where came youth of all Europe. 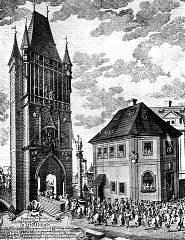 He also founded first Student College – Carolinum (1366). Charles IV established the New Town. He appointed Matyas from Arras to conduct the built of cathedral of Saint Vitus in the style of top Gothic, which was finished by Petr Parler. Petr Parler conduct other magnifies buildings such as are Bridge Tower, Tyn church, church of All Saints. Charles was initiator of building of the Charles Bridge, which replaced Judith bridges (swept away by the flood) The Charles bridge measures 520 meters, had no sculptures in the time of its building and is work of builder Petr Parler. Charles IV founded castle Carlstejn, which is near Prague upon river Berounka and which preserved Crown Jewell and relics collection. Carlstejn castle is also often-visited place. Cleric Jan Hus was one of the first preachers, who show the contradiction, of the Church, who lived other way than they preached. That was the reason why arose Hussite wars. Jan Zizka lead Hussite into the war for the Right and Faith and used all his skills and power. He never lost a battle and had become a symbol of indomitable of the Czech nation. Hussite used uncommon strategy - wagons laid as barriers. Their other guns were made of simply farming tools. Most of Hussite were people from the country – farmers and middle nobility. Only few of them could use real guns such as sword and pikes are. Therefore they adapted common tools, they knew, for war. Hussite used shotguns, but the main Hussite gun was their Faith. Contradiction between Hussite was the reasons of non-unity and in 1343 Hussites lost in battle at Lipany. After than George of Podebrady become next Czech king. In 1541 there was a great fire at Prague Castle, in Hradcany and the Lesser Town. Nor did Prague become the seat of the throne when Ferdinand the Roman Catholic Habsburg was elected King of Bohemia (1526) and the Kingdom of Bohemia became part of the Habsburg monarchy and after the defeat of the first anti-Habsburg uprising of the Bohemian Estates (1547) the Prague Towns people lost a large part of their property and political privileges. But it was a period when culture flourished thanks to the personality and court of the art-loving Emperor Rudolph II. (1576-1612) who moved his seat to Prague in 1583 and endowed Prague's galleries with the best Mannerist art in Europe and invited the respected astrologist Tycho de Brahe and Johannes Kepler and other famous scientists. . In that time Rudolph II founded his famous collection of Arts. There were created buildings and monuments: Belvedere (called The Royal Summer Palace of Queen Anne as well). There is famous Singing Fountain-drops of water make music, in the garden. The Royal Garden-the garden was built in 1534 and embellished during the time of Rudolf II and Ball Hall is its part. Golden Lane - Little houses from the 16th century, behind the St. George’s Basilica, where used to live emperor’s alchemists. Rabbi Jehuda Löw ben Becael was said that invented an artificial man – called Golem, who is still hidden on the field on the Old –New Synagogue, by the legend. Rudolph was more interested in science and arts then in politics so it led to revolts and his brother Matthias took the reign. Rudolph II issued Majestat in 1609 - free faith of Czech non-Catholic walks. Rudolph II is buried in a tomb in the St. Vitus Cathedral. After the independence and foundation of the Czechoslovac Republic, Dr. Tomas Garrique Masaryk becomes the first Czech President. Prague in the Cold War. 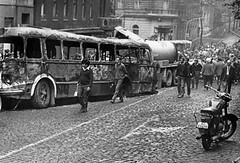 Prague was thenceforth a city in the territory of military and political control of Soviet Union The always lively intellectual world of Prague, however, suffered under the totalitarian regime, in spite of the rather careful program of rebuilding and caring of the damaged monuments after World War II. In the 4th Czechoslovakian Writers' Congress held in the city in 1967 they took a strong position against the regime. This spurred the new secretary of Communist Party, Alexander Dubček to proclaim a new deal in his city and country's life, starting the short-lived season of the "socialism with a human face". 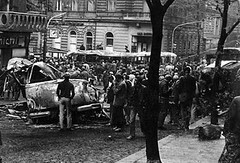 It was the Prague Spring, which aimed to the renovation of institutions in a democratic way. 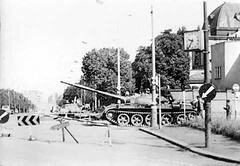 Soviet Union and its allies reacted with invasion of Czechoslovakia and the capital in August 1968 by 7,000 tanks, suppressing any attempt of renovation.